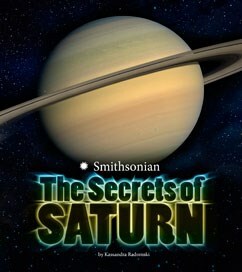 Capstone has just published a new series called “Smithsonian Planets”. Got questions about where the fastest winds in the solar system are? Whether people are going to Mars? What Saturn’s rings are made of? Then you’ll want to read about “The Secrets of Jupiter” and all the other planets: Earth, Mars, Mercury, Neptune, Saturn, Uranus, and Venus. What I like about the books in this series is that they begin with some basic info about the planet: distance from the sun (886 billion miles for Saturn), number of moons, day-length. On Saturn a day is 10 and a half hours, but it takes 29 Earth years to make one complete orbit around the sun. So winters would be really long…. great for skiers, though how one would ski on a gas giant is anyone’s guess. Then there’s the wind: at Saturn’s equator, wind speeds reach up to 1100 miles per hour. Compare that to the fastest wind on Earth, 246 mph, and that was during a hurricane. Kids will learn a lot about the planet, moons, and history of ancient astronomers in this photo-rich book. The text explains concepts well in kid-friendly language, and there’s lots of fun stuff: a timeline of Cassini mission, a scientist spotlight, speculation on what scientists will find next. 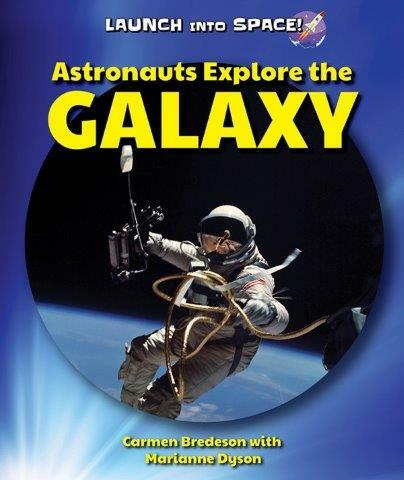 The book opens with some introductory information about astronauts, with each page focusing on one aspect: free fall, what jobs they do, space walking. What do they eat in space? Apparently the same stuff I eat for lunch, only packaged differently – and there’s a great photo of some of their food. You learn how astronauts brush their teeth, use the toilet, and keep their muscles in shape. There’s even some tips for astronauts to be. Head over to Archimedes Notebook for some lunar eclipse news and link to current Saturn news. Problems are like sticker burrs. 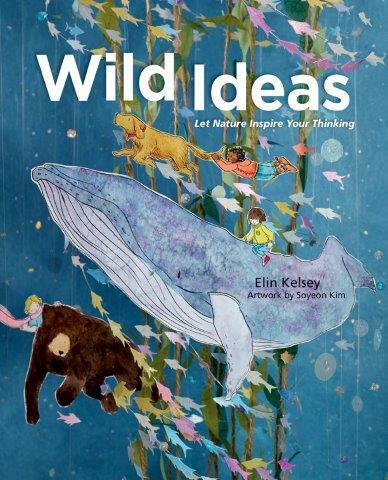 … but sometimes, writes Elin Kelsey, these problems spark marvelous ideas. For example, the hooks on burrs inspired one scientist to develop velcro. So what can we learn from nature, she asks. If squirrels can learn to cross roads by watching people, what can people learn from watching squirrels? Some animals create safe “thinking areas” before tackling a new situation, while others dive right in. Some animals use tools to gather food, some use group strategies to hunt prey, and some learn survival lessons from their parents and elders. I like Kelsey’s encouragement for us to “untame” our imaginations. She gives wonderful examples of animals doing things we least expect: counting, calculating, inventing… and even observing people to learn things, like when it’s safe to cross a street. I also like the three-dimensional dioramas that Soyeon Kim created for illustrating the book. The burrs are huge and detailed, and she tucks children into unlikely places: a gorilla nest, fishing with whales, hunting with hyenas. What fun! I have lots of spiders living in my garden: crab spiders, wolf spiders, jumping spiders, garden spiders…. so I cannot resist a new book about spiders. “Spiders have lived on Earth a lot longer than humans,” she writes. About 390 million years. They can be found in caves, atop mountains, in trees … and just recently scientists in Australia have found an unexpected species of funnel-web spider. 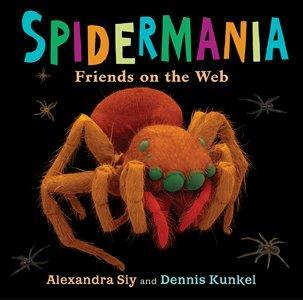 I love that Siy introduces readers to a diversity of spiders, and shows off their web skills. I also love the illustrations – photos and brightly colored electron micrographs that show spider eyes and claws up close. This book is amazing even if all you do is look at the photos! Head over to Archimedes Notebook for some “beyond the book” activities. I love that when you’ve got a bunch of crows hanging about, they’re called a “murder”. And a bunch of cattle is a herd. But what if you’ve got lions? 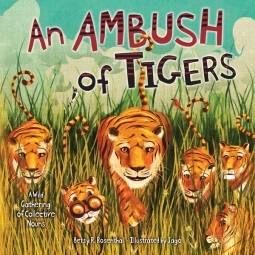 Tigers? Bears? Betsy Rosenthal takes us on a field trip into the wilds of “collective nouns” – the names by which you call groups of things. 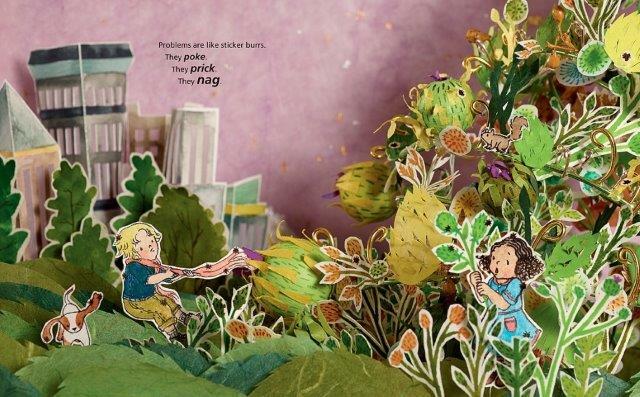 And she does it delightfully in rhyme that is matched with Jago’s imaginative illustrations. We leap with leopards, shiver with sharks, and meet a “sleuth of bears hot on a case”. But what would you call it when all of these animals are invited to a party? What I love is the back matter: a glossary that defines each word and allows room for imagination. Why would a group of porcupines be called a “prickle”? A bunch of giraffes a “tower”? Head over to Archimedes Notebook to learn more about collective nouns for animals, people, and things.